We offer managed WordPress hosting and Zimbra email. We can deliver this direct to the consumer, or through a third-party as a white label service. Further details of our Zimbra services can be found here. Please get in touch with support@opensure.net, or if you prefer use the contact form. We offer detailed syncing advice free of charge to our clients. Please get in touch and we’ll be very happy to help. We’ve built up our guides based on experience and what our clients ask for. People build up individual combinations of devices and programs, so rather than providing a list as long as your arm, or possibly longer, we’re including here the ones we know people want to see. 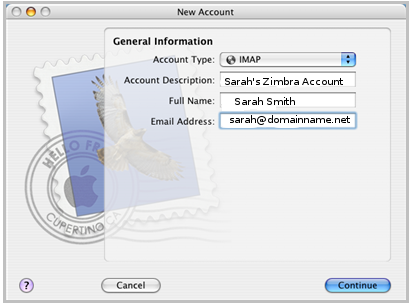 The first step to creating your new Zimbra account in AppleMail is to select the IMAP setting. Give the Account Description field a title useful to you (no-one else will see that field). In Full Name enter your name as you’d like it to appear in recipients’ inbox, and in email address enter the email address we’re providing for you. Click on Continue. 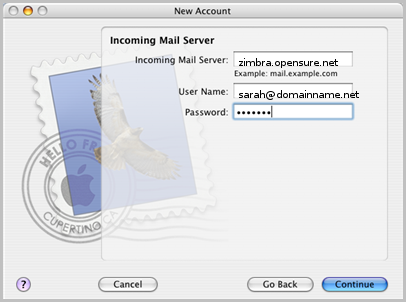 The address for the Incoming Mail Server is zimbra.opensure.net. Your User Name is your email address. Enter your password then click on Continue. 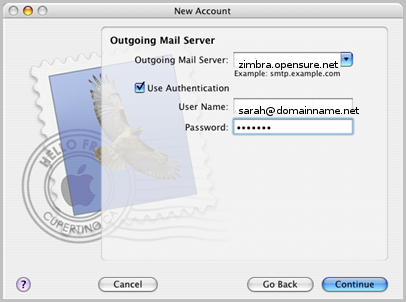 The Outgoing Mail Server is also zimbra.opensure.net. Tick Use Authentication, then once again enter your email address in the User Name field, and fill in the Password field. Click on Continue. Make sure the Use Secure Sockets Layer (SSL) field is ticked, and set Authentication to Password. Click on Continue. Using Activesync Clients with Zimbra 7+ and beyond. You can use our new beta service to sync your device eg smartphone, tablet etc using Activesync with our Zimbra 7+ service. We deploy a Z-Push service to do this for you and as a result only three bits of information are needed. This allows you to use any standard Activesync client to synchronize email, contacts and calender to any number of common mobile devices including iPhone, Android and even Microsoft including Windows 8 devices. Some clients will require additional information such as the preferred email address and other specific information that it may use but the above information is common to all. You can use the open standards CardDAV and CalDAV to easily synchronise your Zimbra Contacts and Calendars to your Android smartphone. Android has no native CardDAV client but some are available from the Google PlayStore and F-Droid.org. We now recommend the free DavDroid which works well. We talk you through configuring that client but essentially any others that are available will be similar. To sync Tasks with DavDroid install the Open Tasks app from the store/F-Droid and then re-install DavDroid. Once you install DavDroid it will appear in the Android Account Sync area, but simply starting DavDroid will give you the option to Go to accounts & Sync. Select Add Account, and choose Login with URL and username as the account type. The server name is eg https://zimbra.opensure.net. The app will then check the connection and ask for an account name for you to identify the configuration by, eg the email address. Change this as or if desired. Leave the groups as separate VCards. Your contacts and calendar (and Tasks) are now able to sync. To change which calendars and address books will sync, open the Accounts area under Android Settings and click on the DavDroid section listing the DavDroid accounts. Select Manage Accounts and Click on the account shown that you want to configure. Select the Calendars and Contacts from the list that you want to sync to/from your phone. The Settings Cog under each accounts area will allow you to more finely configure things like intervals, connections etc. You can use the open standards called IMAP and SMTP to synchronise your Zimbra email to your Android smartphone. Android has several email clients available but we recommend an open source one called K-9, free from the Android Market. We talk you through configuring that client but others will be similar. Authentication is Plain, Port 993, leave IMAP Path Prefix as default. K-9 will now check the configuration before moving on to the outgoing server. Security is TLS if available and the port should be 587 (not 25). Authentication should be PLAIN and the user/password should be the same as for IMAP. Click Next and wait until it has finished verifying configuration. Give this account a name that makes sense to you, eg Simon’s OpenSure Account and then give the name that shows when you send message eg Simon Sayes. Then click Done and the account is ready for use. You can use the open standards called IMAP and SMTP to synchronise your Zimbra email to your iPhone or iPad. It will probably fail to get the service auto-configured so you will likely get the Cannot Connect Using SSL message, or similar, just select Yes, you will just need to adjust account settings later. You can use the open standard called CalDav to synchronise your Zimbra calendar to your iPhone or iPad. Configuring Thunderbird and Zindus to synchronise your Contacts on our Zimbra service. Again we recommend using Zimbra Desktop to do this but if THunderbird is your thing then here is how you can do a neat synchronizing trick with the smart Zindus add-in. First we assume that Thunderbird is properly installed and configured ready for your OpenSure Zimbra email account. Once installed, in Thunderbird select Tools – then Zindus. Your username is your Zimbra email address and then enter your Zimbra password too. All your account’s contacts lists download and are shown as zindus/GAL or zindus/Emailed and your main Contacts one is shown as your Personal Address Book in Thunderbird. Then you can use the contacts within Thunderbird and on the web too! To get perfect syncing with Zimbra we recommend using Zimbra Desktop but something very useful can also be done with Thunderbird. This assumes that you already have installed Thunderbird mail client properly and configured it for your Zimbra email. You then need to install an Add-in from here: Lightning for Thunderbird. Download and follow the instructions to install the add-in in Thunderbird. Lightning extension works by using caldav which means it can talk to your Zimbra calendars using a URL connection and a password. To enter this simply go to the newly appeared Calendar tab in Thunderbird, Click add new calendar eg via File, New, Calendar and select On the Network. Then select Caldav and put in the location box the URL above, changing it to match your email address. Give your new Calendar a name that makes sense to you, perhaps select a colour and associate it to your Zimbra Email account on Thunderbird. When done, it will ask you to enter your username (your email address) and your password (your Zimbra one) and offer to save it, which you probably will want. That’s it, your Zimbra calendar will appear as it would on the web but now in your Thunderbird client. This is designed to help you setup a new account in Outlook for your new mailbox. We recommend Thunderbird (www.mozilla.com the same people who write Firefox web browser – also recommended) as a free and powerful mail client in preference to Outlook as it is a standards compliant approach and works very well with modern mail systems. However, this is about what you want to do so here you go! In the Display name box, type the name that you want other users to see when you send a message, and then click Next. In the E-mail address box, type the e-mail address for the account that you are using (for example, type my.name@domain.here), and then click Next. Type zimbra.keepnet.net as the incoming (IMAP) and outgoing (SMTP) servers and Click Next. Type your IMAP account name and password in the Account name and Password boxes then click Next. In the Internet Mail Account Name box, type a name to identify the mail account, and then click Next and Click Finish. You should now be able to highlight this new account in the Internet Accounts window and then select ‘Properties’ When in this window click Advanced. In the Advanced window tick Incoming Mail – This server requires a secure connection SSL – the Port will automatically change to 993. Above this is the Outgoing Server equivalent tick box. You can try setting this as SSL and change the port number to 465 as some Outlook versions do appear to support this. If this is not the case then you can leave this unticked but we recommend you change the Port Number to 587. At same Properties window as when finding the Advanced tab, you will see a ‘Servers’ tab. 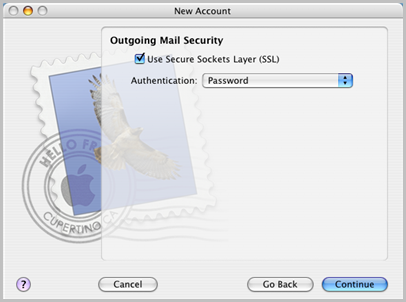 Move to this and click the Outgoing Mail Server – My server requires authentication. Leave as using the same settings as incoming mail server. Click OK then Close to close the Internet Accounts dialogue box. When you are prompted to Refresh or download folders from the mail server, click Yes and enter password assigned as required. This is designed to help you setup a new account in Thunderbird for your new mailbox. We recommend Thunderbird (www.mozilla.com the same people who write Firefox web browser – also recommended) as a free and powerful mail client in preference to Outlook as it is a standards compliant approach and works very well with modern mail systems. Select Tools – Accounts settings then select Add Account, Email Account type and click Next. 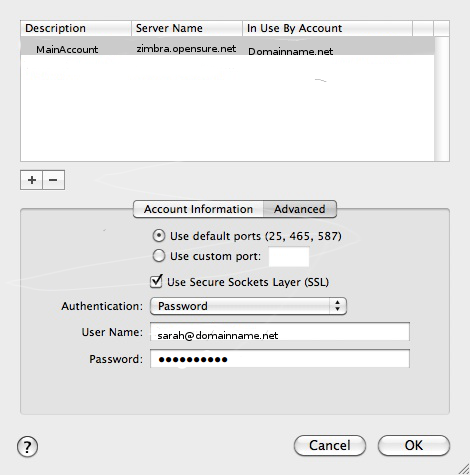 Select IMAP as the type of server and enter zimbra.opensure.net as the name, it is personal choice whether to select global folders or not, most tend to. Click Next. Now enter incoming username, which is the same as your email address click Next. Enter the name you would like to use to refer to this account and click Next, confirm all is correct and press Finish. In the left hand panel, highlight and expand the new account named above and click Server Settings. In this Click Incoming server uses SSL and check that the port has changed to 993. Now click down to Copies and Folders for this account and check that the Sent, Draft and Template folders are showing as send a copy to whatever the name of this new account is. Composition and Addressing, set as per your preferences. Clicking now into Off-line and Disk space, please set as per your preferences normally tick both top boxes and select all folders available off-line. Leave the lower section to retain all email. At the bottom of the left hand panel is the list of Outgoing servers, here click add and add the name of Zimbra, server as zimbra.opensure.net, change the port to 587, tick TLS, tick username and password and fill is with your username (same as email address). Click OK.
Now click Get Mail and enter your password as required, saving it permanently if desired. Our WordPress guides are part of a growing library of WordPress resources. Backed up by two WordPress demo sites – one aimed at giving you an idea of how features can look, and the other deconstructing the elements of a WordPress site – these guides will help you use WordPress features such as Categories, Widgets and menus. Click here for the WordPress guides. No problem. If you’re a client please don’t hesitate to ask for a walk-through that isn’t here. If it’s within our remit to provide one, then we will. Using the contact form please give us details of what you’re trying to do.